The Israeli-Palestinian conflict is widely viewed in the U.S. as one of the most complicated geopolitical disputes in the world. But there are also signs that Americans are unfamiliar with one of the core flashpoints of the conflict: the exact nature of Israel's ongoing military occupation of Palestinian land. Occupation 101 lays out the basic facts of the occupation in vivid and heart-wrenching detail, offering a crystal-clear and myth-shattering history of Israel's systematic dispossession of Palestinians from their land. Features Middle East scholars, journalists, religious leaders, and humanitarian workers. "A Visual Revolution is Born!" "One of the best documentaries"
"Omeish ...has dedicated his career to presenting stories that people in Hollywood would normally be too afraid to touch: stories of the Palestinian experience. Occupation 101... remains the finest presentation of the Palestinian narrative I have ever seen. Omeish's documentary ruffled many feathers in Hollywood for its political message, and yet even his detractors cannot deny the artistry and sophistication of the film. 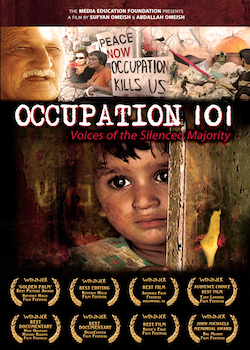 Occupation 101 set the bar for 'alternative' storytelling about the Middle East in terms of seriousness, savvy and production value, and as a result presented the first real challenge to the mainstream narrative about Israel that has been entrenched in American media for decades."